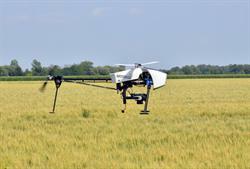 OTTAWA, ON--(Marketwired - September 18, 2014) - Agriculture and Agri-Food Canada has selected ING Robotic Aviation, a high tech robotic aircraft company, to demonstrate a new method for assessing crop vegetation. 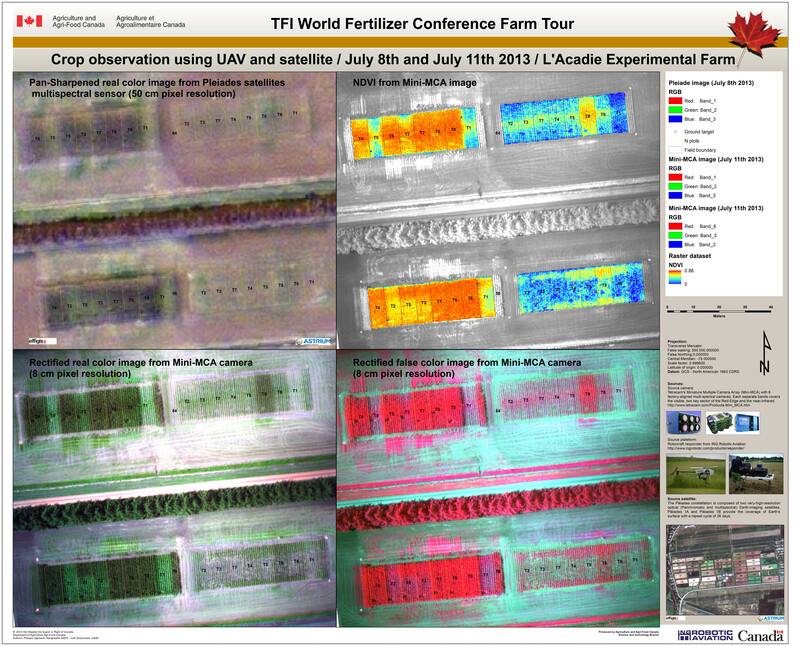 They will be using an aerial multi-spectral camera to provide detailed, real-time information on crop health. 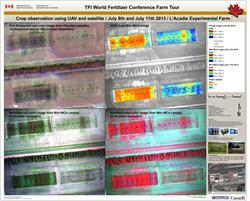 To the uninitiated the result looks like an Andy Warhol picture, while to an agronomist the image is full of data. ING Robotic Aviation is collecting aerial data at the Horticulture Research and Development Centre in St. Jean-sur-Richelieu, Quebec during the summer in order to assess vegetation/crop health. Using the Responder rotary wing robotic aircraft equipped with a TetraCam Mini-MCA6 sensor for the data acquisition, the team will provide 6-band multispectral imagery for 2D vegetation mapping. "Monitoring is an important task for agriculture," states ING Robotic Aviation's CEO, Ian Glenn. "Robotic aircraft are reliable tools that provide the right information in the right hands at the right time." No other technology can gather as much and as detailed information nearly as quickly, cost effectively or safely. The Responder can cover 1000 hectares in 25 minutes, while collecting the necessary imagery. ING Robotic Aviation delivers airborne sensing solutions and much more. We developed our skills through extensive operational surveillance work with the Canadian military and our flights added up would circle the globe 81 times. From these beginnings, we are now providing mapping, inspection and monitoring services in key sectors such as oil & gas, mining, utilities, forestry and precision agriculture. We are at the forefront of a disruptive technological and operational change, focused on reinventing aviation. Agriculture and Agri-Food Canada is a department of the Government of Canada that provides leadership in the growth and development of a competitive, innovative and sustainable Canadian agriculture. They provide numerous programs and services to citizens, including AgriInnovation Programs that help bring new technologies to the market, by working with industry partners to increase the successful demonstration, commercialization or adoption of agriculture, agri-food and agri-based innovations. They are constantly working on new initiatives to support Canada's agricultural and agri-food sector and its producers and processors.